One disadvantage of having the plants out in the main store is that I couldn't just investigate in peace -- as soon as I took the basket down and started taking photos a helpful (?) employee asked if I needed any help. Of course I said "no thanks, I'm fine", but what I should have said was: "yes, thank you. What species is this, and what part of the world does it come from?" And it needs light (unlike the other succulents growing on the dark shelves I guess). So I'm out of luck on getting help with the ID there. I had a feeling that I saw a plant like this in one of Gerhard's posts on Bamboo, Succulents, and More, but I'm not sure how to find it. The majority of the plant was smooth and spineless, but in there, plenty of spines. I'm pretty sure I determined that the prickly parts were connected to the smooth parts, but now I can't be certain. If they are, does this mean that the entire plant will eventually become prickly? Or is this really two separate plants? This is such a pretty plant though! Interesting too, and unique. I'm hoping for an ID in the comments below so I can do a bit more research. Then maybe I'll stop back in the next time I'm in that part of town and pick up a cool new succulent! Ah, yes. 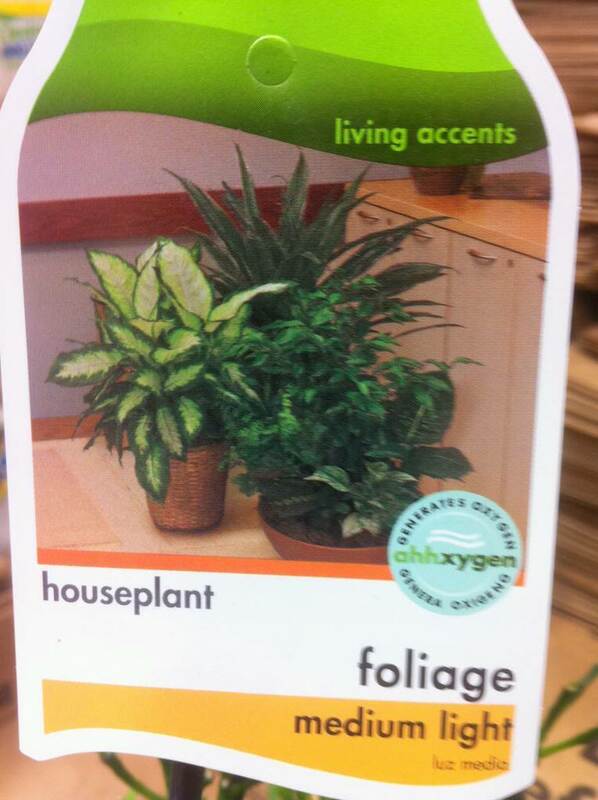 I've had several (un)helpful trips to Home Depot and other big box warehouses when I needed that emergency plant. There comes a time when you realize you have more horticultural knowledge than the entire staff combined. (and 'they' are supposed to help 'you'?) But that's when I start helping other customers who mistake me for an employee! Always fun. And I love your 'nuggets of truth' from that tag - hilarious! I wish I could offer help ID-ing the plant. Although to me it looks like something that belongs on a coral reef. I'm interested to see what others think. When I saw the first photo, I thought it was a medusoid euphorbia (like Euphorbia flanaganii) but on closer look this appears to be a cactus, not a euphorbia. 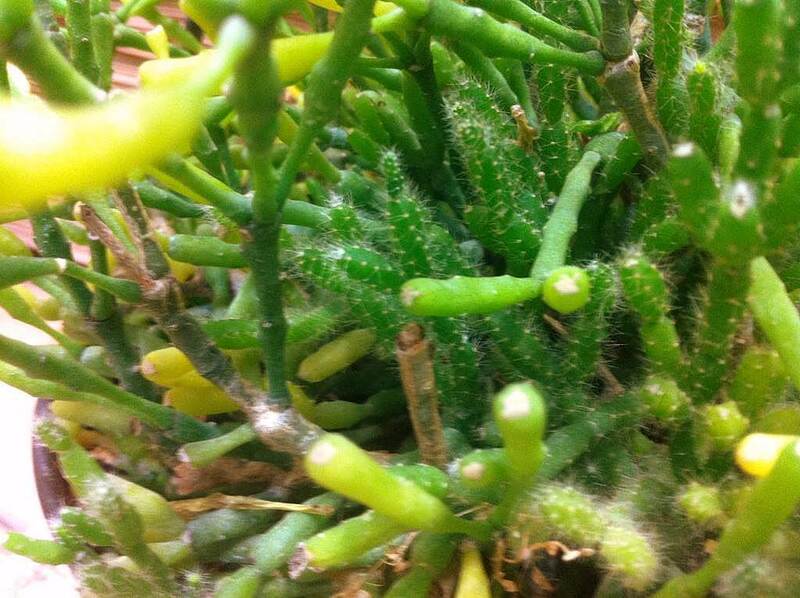 I'm not an expert on epiphytic cacti but your plant looks like a rhipsalis species. 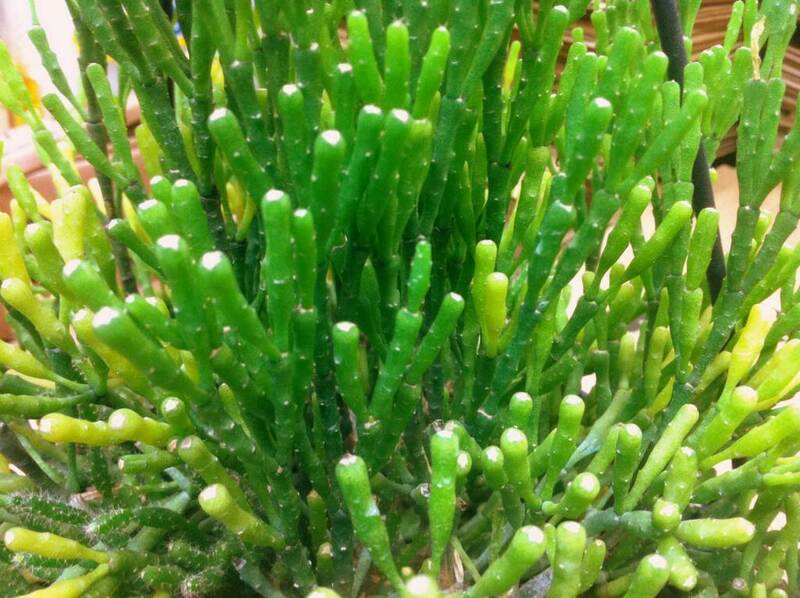 This site might be helpful: http://cactiguide.com/cactus/?genus=Rhipsalis. Gotta love those tags. My favorite are the "cactus gardens" that are completely made up of succulents, not a cactus in sight. 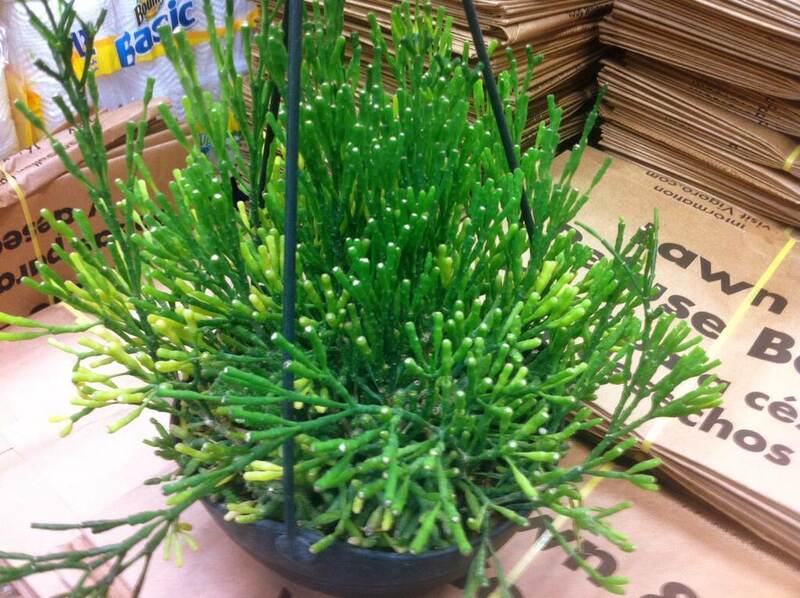 For this one I'm going with "drunkard's dream" or Hatiora salicornioides or Rhipsalis Salicornioides. danger: will the whole plant eventually get prickly? If the growth is truly "slow", then this plant is a bargain -- it was $10! 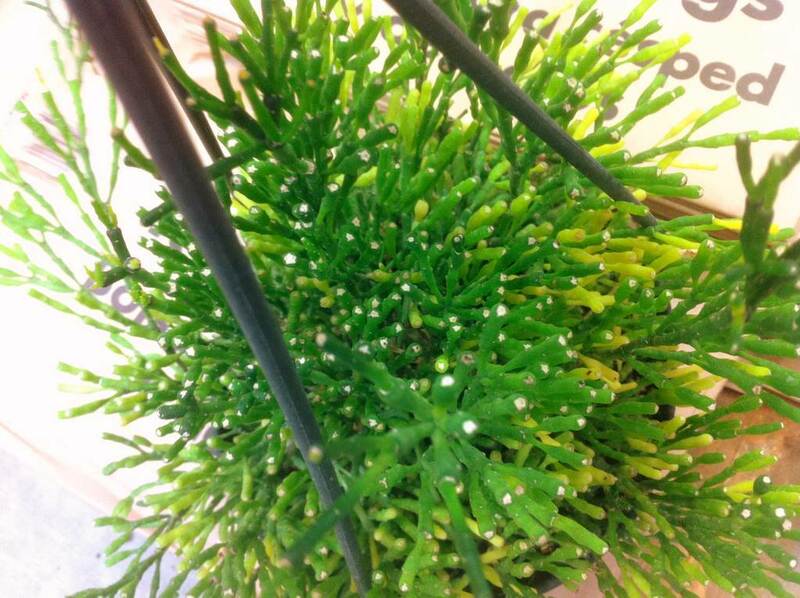 If its the Rhipsalis, they don't grow anywhere near as slow as claimed. Mine have always grown fairly quickly. I throw leaves in a blender and make a fine mulch, and make potting soil out of it, 50% leaves, 30% crumbled rotted wood, and the rest in sandy loamy dirt. Works great. I went and left mine in the greenhouse through a really hard freeze with no added heat- so I think they're toast. I had 'em for years before that smooth move. They bloom in tiny yellow daisies. No prickles to speak of on mine, either. Really lovely plant. Interesting looking plant, I'll be interested to know what it is. I just happened to come across your post when I googled DIY succulent hanging basket. I too have the same plant from HD and do not know what the hell it is, other than a succulent. Mine had no tag. But little good it would have been. I have had mine for almost three years. It lives outside in its pot in the summer and then I bring it in in the winter as a house plant. It grows well, but does loss it's foliage quite a bit. If you have found out what it is, please pass the info along. It looks like one I recently purchased also from a "big box" and was incorrectly labeled a hedgehog aloe. 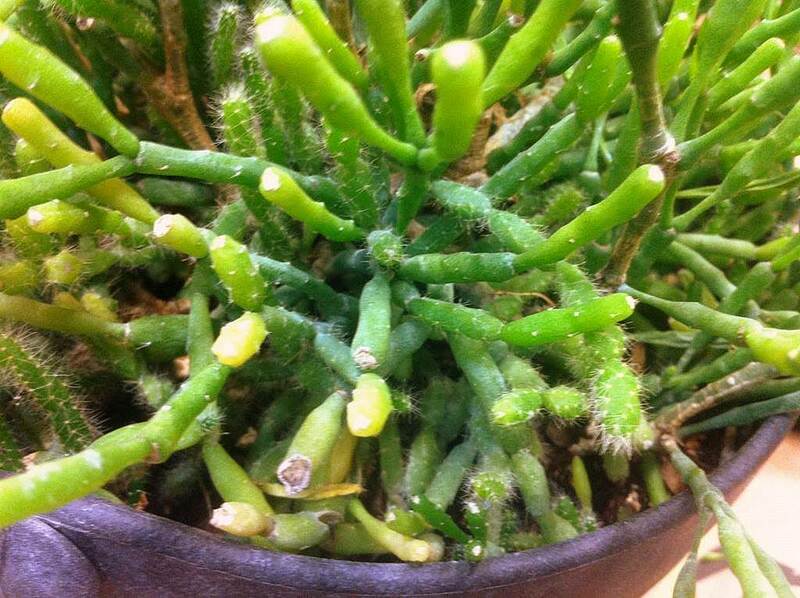 I think it's a finger jade or crassula ovata. My Roommates mom gave us this plant about a year ago, apparently she's had it for a long time. To our surprise this plant started blooming this past spring small yellow flowers! very cool! This may be too late to do any good, but the plant in question is a Hatiora salicornioides. The spines are frequently present on young growth, but fall off as it matures. drunkard's dream. not prickly. you got a bonus cactus in the pot.